Marin Alsop leads the Baltimore Symphony Orchestra and the Morgan State University Choir, as well as vocal soloists, in a semi-staged production of Porgy and Bess. On Thursday, April 11, 2019, the Baltimore Symphony Orchestra at Strathmore in North Bethesda, presented a “semi-staged” production of George Gershwin’s classic, “Porgy and Bess.” with libretto written by DuBose Heyward and lyrics by Ira Gershwin. Marin Alsop led the Baltimore Symphony Orchestra and the Morgan State University Choir (under the direction of Eric Conway), as well as vocal soloists. Hana S. Sharif directed the staging of the performers. The English-language opera was based on a play by Heyward called “Porgy” which was an adaptation of Heywood’s novel by the same name. The opera opened on Broadway in 1935 and was called, by Gershwin, a folk opera. Its subject matter has always been controversial. The white-racists were against it for obvious reasons. It was unusual for African-Americans to have major roles on the “legitimate” stage, never mind have an almost all-black production. The African-American community has felt right from the start that its characters and situations promote white’s stereotyped images of their community and their people. The opera should be looked at historically. Gershwin tried to capture the culture of the southern black community by traveling to South Carolina to Folly Beach (a small island near Charleston). His use of jazz and operatic form throughout the score made the music a vehicle for many black artists like Ella Fitzgerald, Cab Calloway, Leontyne Price and Louis Armstrong. A protest in 1936 at the National Theatre by one of the performers, Todd Duncan who played Porgy, resulted in having the first integrated audience in that venue. Gershwin himself insisted the cast be operatically trained African-Americans. Only the law enforcement officials were white and did not have not singing roles. Gershwin’s work reflected both jazz and Eastern European Jewish roots. In “Porgy and Bess,” he also incorporated some of the formats of European Opera. “Porgy and Bess” became a movie in 1959 and starred Sidney Portier, Dorothy Dandridge and Sammy Davis, Jr., but due to restrictions by the Gershwin family, it never was widely seen after the 1970s. (They were not happy with the adaptation.) The opera has been performed internationally and now has had many revivals and two adaptions. The description of semi-staged may not be understood by all. That means, in this case, the performers acted out their roles and wore costumes but there was very little set. There were no large production numbers, no real dance sequences or special effects like we have become accustomed to seeing in musicals. The backdrop was the orchestra and the Morgan State University Choir. For those familiar with only the movie, this performance was done as Gershwin envisioned. Almost every word was sung and in this case in dialect. So, as done in opera, the words were displayed on a screen so you could follow the story. For that matter, the program had a complete synopsis of each scene. There were no surprises. It was treated like a folk tale where we all know the plot. Some of the music from Porgy and Bess have become American standards, the best example being ‘Summertime,’ and ‘Porgy and Bess’ may be the greatest American opera. It continues to be performed all over the world. Lester Lynch’s baritone reeked of self-assurance and ominousness as Crown, the tough stevedore and Bess’ paramour at the beginning of the story. As he sang to Bess in Act II Scene 2, struggling to physically reclaim her, his character vocally and physically conveyed his lust and need to control. Sportin’ Life is symbolic of the devil. Larry Hylton landed this charming but evil man. His version of “It ain’t necessarily so” and “There’s a boat that’s leavin’” showed his power as a bootlegger and drug dealer to ensnare his victims and tempt those who are not totally virtuous. In the other supporting roles, Jasmine Habersham as Clara captured the haunting lullaby “Summertime” during the opening, and Cameron Potts (Morgan State University student) mastered the more cynical song to their baby son, “A woman is a sometime thing.” Reyna Carguill exquisitely caught Serena’s sorrowful “My man is gone now’ grief-stricken by the murder of her husband. Alexandria Crichlow- Bradshaw (MSU) played Maria, the matriarch of the church, who warned her fellow congregants not to be tempted by the devil. Her performance was remarkable as is Darrin Scott (MSU) as Robbins and Mingo. 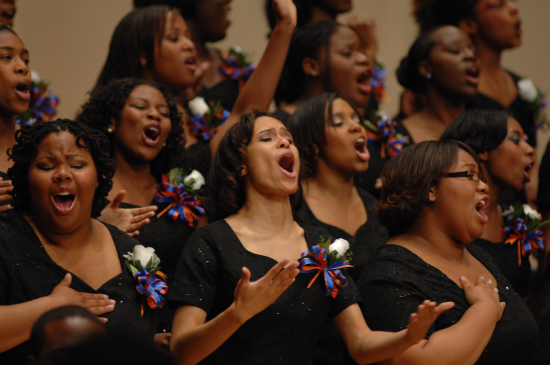 Using the renowned Morgan State University Choir created an enthralling experience. They were really the chorus in this production and delivered whether they were singing gospel or jazz. Conway has created a wonderfully harmonious young choir. Having a full symphonic orchestra, the BSO, was a perfect way to present Gershwin’s music. Alsop’s conducting was masterful. The direction by Sharif kept things flowing and spotlighted the great musical moments of the opera. Some of the music from “Porgy and Bess” have become American standards, the best example being “Summertime,” and “Porgy and Bess” may be the greatest American opera. It continues to be performed all over the world. If you can get to see this production, you won’t ever regret it. Running Time: Two hours and 10 minutes with an Intermission. “Porgy and Bess” will be presented by the Baltimore Symphony Orchestra at the Meyerhoff in Baltimore this weekend. For tickets online. The BSO will be back at the Strathmore with more Gershwin “Movie with Orchestra: An American in Paris” on May 2, 2019. For more information about that concert and other performances at the Strathmore by various artists contact Strathmore.